L-R: Chairman and Director General, Middle East Airlines, Mr. Mohamad El-Hout and Deputy Chairman and Chief Executive Officer, Turkish Airlines, Mr. Bilal Ekşi, during the signing of a codesharing agreement in Beirut, Lebanon, recently. Nigerian passengers and passengers from other countries, who travel on Turkish Airlines (TK) and Middle East Airlines (ME), will be part of the beneficiaries of the codeshare agreement recently signed by the two airlines. The agreement, which becomes effective as of May 15, cover routes between Turkey and Lebanon, and expands the travel opportunities for the passengers of both airlines. The signing ceremony took place at MEA Head Quarters in Beirut. 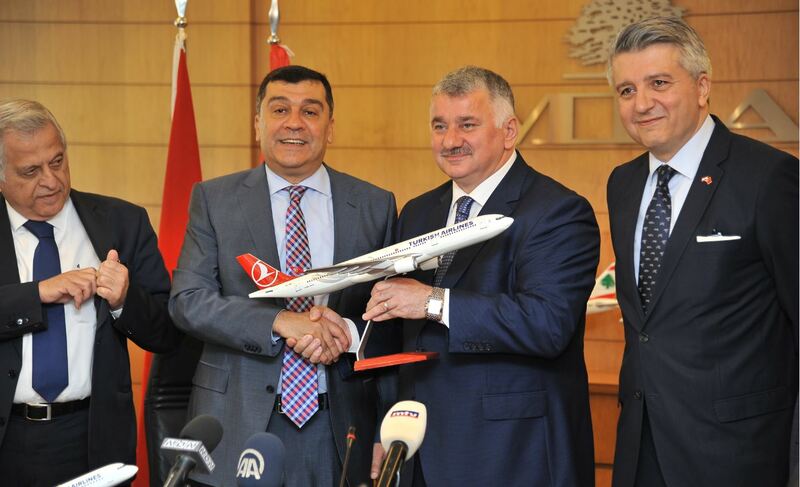 Middle East Airlines Chairman and Director General, Mohamad El-Hout and Turkish Airlines’ Deputy Chairman and Chief Executive Officer, Bilal Ekşi, signed the agreement in the presence of senior officials from both sides. According to the airlines, the new codeshare agreement will broaden the commercial partnership between the two companies and their respective countries. At the same time, passengers of both airlines will be given more travel options between Lebanon and Turkey. “Under the terms of the agreement, Middle East Airlines and Turkish Airlines will place their codes on the flights of Middle East Airlines on Beirut – Istanbul v.v. and on the flights of Turkish Airlines on Istanbul – Beirut v.v. route. Turkish Airlines will operate three daily flights on Istanbul-Beirut-Istanbul route, while MEA will be operating 2 daily flights Beirut - Istanbul –Beirut route,” the airline operators said in a statement. Commenting on the pact, El-Hout expressed the importance of this agreement, as being a step in stimulating the economic cooperation between Lebanon and Turkey, and will enable both airlines to further accommodate the needs of their loyal passengers. “It is worth highlighting that this agreement is signed between two members of two different airline alliances, which prove the ability of both airlines to expand their networks to the cities not served by their aircrafts,” he said. Ekşi also stressed that travelers of both airlines will experience a streamlined level of services covered by the agreement onboard two modern fleets of aircraft and he expressed his hope that this step will be the first on the way to further enhancing relations between two airlines in the future. It would be recalled that Turkish Airlines has been championing the cause of deepening codesharing agreements with national carriers across the world with a view to bringing about efficiency in their operations and create a smoother and hitch-free journey for passengers across the world. Turkish Airlines’ Country Manager in Nigeria, Mr. Tarkan Ince, lamented lack of a functional national carrier in Nigeria which Turkish Airlines would have loved to partner with towards ensuring robust travel opportunities for the passengers of both countries.